I want to celebrate the greatest GOP salesperson in history: Alexandria Ocasio-Cortez (aka AOC). With enemies like AOC, who needs friends? No friend of mine, or any friend of the GOP, could ever do for Republicans what Ocasio-Cortez is doing on a daily basis. The more AOC and her communist cabal talk about killing farting cows; trains that cross oceans; ending all cars, trucks, boats and planes; "upgrading" all homes and buildings; free housing for all provided by Big Brother; a guaranteed income, whether you feel like working or not; their love for socialist hellholes such as Venezuela; and their hatred for Israel, it spells a Trump landslide in 2020. AOC is the best thing to ever happen to Trump and the GOP. Don't take my word for it. Nancy Pelosi and the Democrat leadership hate her more than me. Rumor has it that the Democrat leadership is already planning to eliminate her district after the 2020 election. She won't have anywhere to run. That's how much they like AOC after one month of listening to her hysteria, delusion and babbling fantasies. Now add in AOC's depressing musings about having babies. She says we all may die in 12 years because of global warming, so no one should reproduce. AOC is as warm and fuzzy as assisted suicide. When she walks in the door, even hell freezes over. The best way to describe AOC? She is, like, a "valley girl" updated for 2019, mixed with, like, a communist dictator. I say "like" because she says "like" a lot in her statements. Just like a "valley girl." If I met a genie and he granted me just one wish, it would be for AOC to, like, keep talking. The numbers are out, and they will scare normal Americans to death. AOC's Green New Deal should be renamed the Green Suicide Deal, because it is clearly suicide for America. 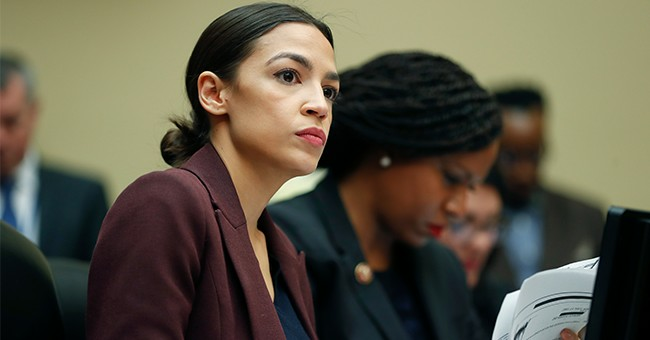 A new analysis headed by the former director of the nonpartisan Congressional Budget Office reports this Green New Deal will cost about $93 trillion. That's, like, all the money in the world -- and then some. Like. Let me give you some real-life examples of how much money AOC wants to spend so the world doesn't end in exactly 12 years. -- $93 trillion is almost five times the annual U.S. economy. -- $93 trillion is more than the annual world economy. -- $93 trillion is more than four times the staggering U.S. national debt. The U.S. government budget is $4 trillion. AOC wants to spend almost 25 times more than that. If $1 represented 1 millimeter, AOC's Green New Deal would travel 2,325 trips around the planet Earth. Would that be on a solar-powered train? That's more than $600,000 per household in new debt. But AOC, like, where would all the money come from? Trees? Sugar plum fairies? Unicorns? Fidel Castro? That's just insane. But AOC is, like, the greatest GOP salesperson in history. Thank you, AOC. Wayne Allyn Root is a CEO, entrepreneur, best-selling author, nationally syndicated talk show host on USA Radio Network and the host of "The Wayne Allyn Root Show" on Newsmax TV nightly at 8 p.m. ET.